I invite you to sample seasonal North Carolina meat and produce at their freshest, most respectfully prepared at Knife and Fork. Located in the breathtaking Blue Ridge Mountains in northwestern North Carolina, Knife and Fork’s delicate dishes are a surprising find far from the typical, big city devotees of the farm to table and slow food movements. It didn’t seem that long ago (really? 15 years?) since the concept of farm to table took root in New York City and other urban metropolises starved for fresh, local, and seasonal food prepared with reverence. Yet the concept became a movement, joined in parallel by several others that has swept the developed world – and which I’ve seen firsthand (you can find a few great examples in my posts such as Neh and Ribe in Tallinn, Estonia; Bistrot Glouton in Bordeaux, France; Zielona Kuchnia in Krakow, Poland; and basically any of Gaston Acurio’s Peru-based restaurant empire). Check out the second episode of Netflix’s doumentary series, Chef’s Table, which features New York’s Dan Barber and his Blue Hill, to learn more about the origins and philosophy of the movement. So it shouldn’t have surprised me to find another gem in rural, mountainous North Carolina, but having grown up in the American South, Spruce Pine’s Western Sizzlin’ and heavy fast food were more in line with my snobby expectation. My world traveler’s snobbery got the best of me until I saw the light that is Knife and Fork. 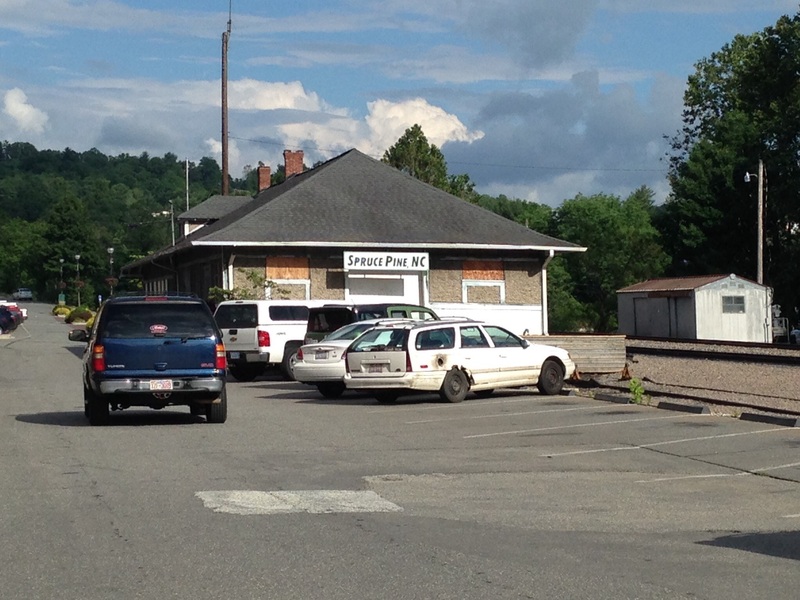 Spruce Pine’s historic ‘downtown’ is one street that parallels railroad tracks and a long-abandoned train depot. It’s not much to look at, but charming local businesses have staked their claim to Main Street fame (for the record, it’s actually Locust Street. But it works to say that with the Main St. vs. Wall St. comparison that popped up after the 2008 Global Financial Crisis). Knife and Fork, and its adjacent sister, Spoon cocktail lounge, have subtle signage. It’s almost as if they want to be the area’s most closely guarded secret for only those most worthy. As soon as I walked in the door, Knife and Fork’s decor spoke my language. I didn’t need to so much as look at a menu to get its concept immediately: The blond wood, simple furnishings, antiqued gilt frames surrounding mirrors and art told me that it was going for the best and freshest presentation of local ingredients. If it wants to be western North Carolina’s culinary ambassador, it does its state proud. Ok, enough rambling from a guilty yuppie. Onto the restaurant and its food! First of all, I have to say that the menu is not straightforward. It requires a bit of interpretation or explanation for most laypersons. Local trout, rabbit, and famous Carolina pork are easy enough to recognize, but obscure names for often lesser-known greens, herbs, and cheeses may be a bit confusing. I will admit that I had to shrug my own shoulders when trying to decipher a few offerings for my friends and humbly accept explanation from our waiter. Cavolo nero? No? How about dinosaur kale, anyone? Nah, I was familiar with neither; they’re one and the same. The menu changes daily, depending upon seasonality and availability, so I can only help you, the prospective traveler, but so much! 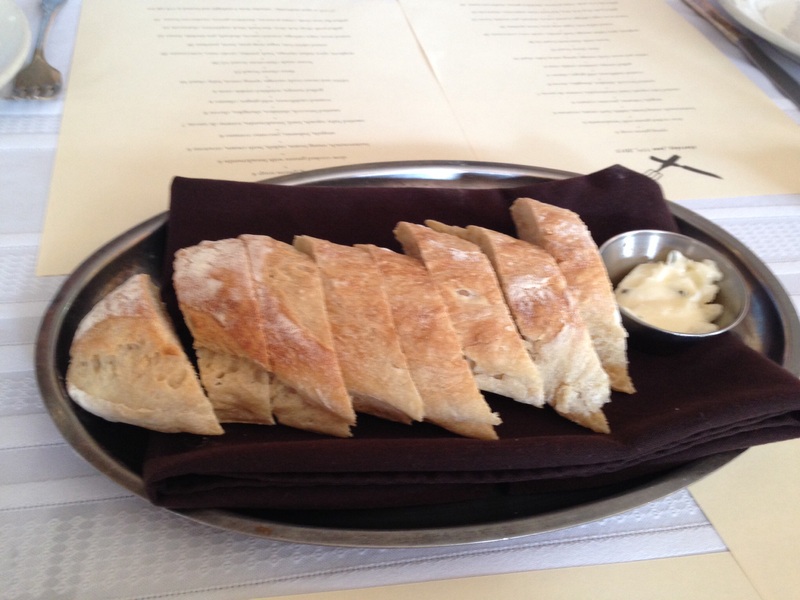 Nevertheless, you can expect a perfect sourdough loaf (above) accompanied by a homemade compound butter infused subtly with thyme, honey, and rendered pork fat to welcome you as you ponder the sometimes perplexing menu. I’ll share a few highlights from our group’s choices (menu pictured above in the featured image). 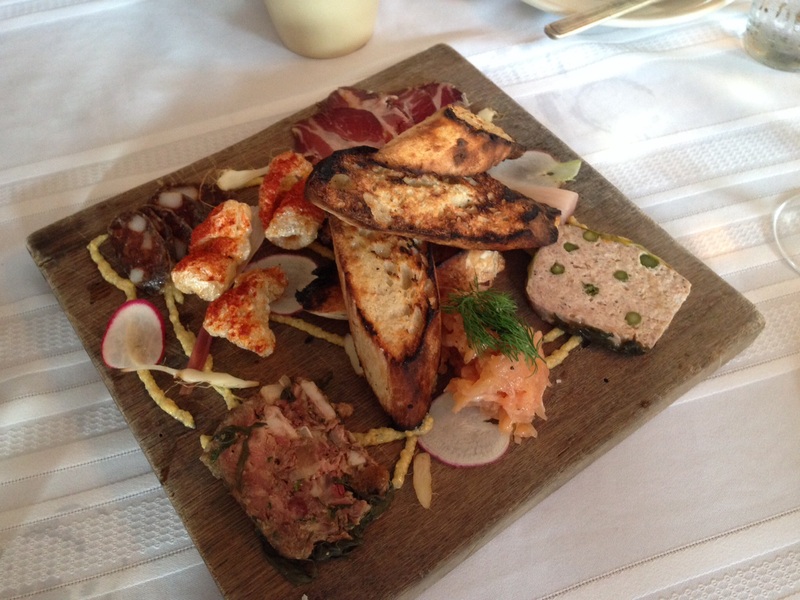 The charcuterie board (above) is an over-the-top smorgasbord that successfully reimagines the European model with house-made jewels like smoked trout, head cheese terrine (you read that correctly. Google it if you’ve never made its acquaintance. If it turns your stomach, don’t write it off. My group loved it), a spring rabbit and asparagus terrine, beef pepperoni, smoked pork shoulder, and slightly blackened crostini. 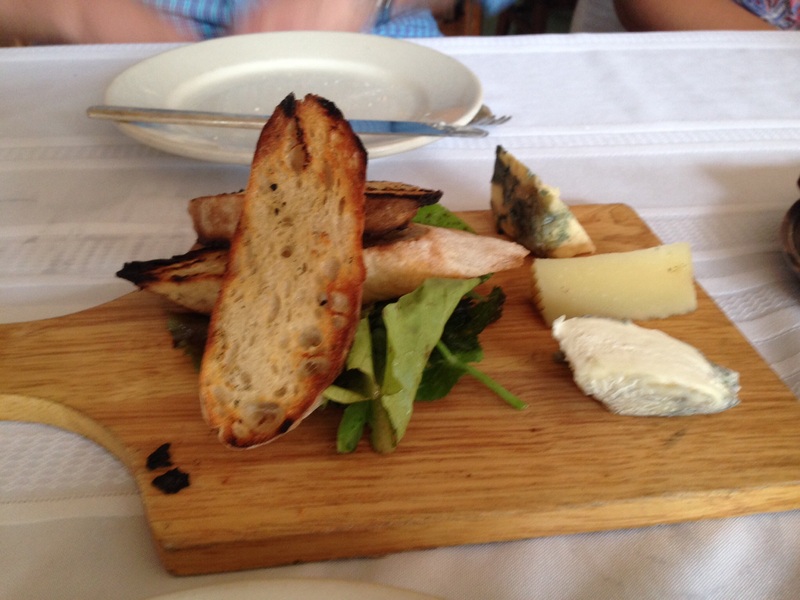 The three cheese board (above) is restrained in a very non-Southern manner. On this occasion, it featured small portions of regional blue and goat cheeses and also Manchego, which forced me to savor every tiny bite so that others could enjoy it too. Such a shame. I could have polished it off singlehandedly. Our party’s overwhelming favorite entree was the flat iron steak, served that night with dandelion greens, crispy potatoes, and a mushroom butter. The steak was tender and simply cooked, and the greens and potatoes were hearty compliments without weighing down the meal. Homemade pasta is one feat. Homemade spaghetti is another challenge entirely. Knife and Fork’s flat spaghetti was almost translucent in its fragility, served with Italian sausage, that dinosaur kale, and a light goat cheese whose Italian name escapes me -all form an assertive yang to the delicate pasta’s yin. We also ordered several vegetable small plates. They were simply dressed, beautifully presented, and not at all overcooked. Broccoli came paired with shungiku (the bitter, leafy green of a daisy-like flowering plant), shiitake and chèvre. Summer squash (AKA zucchini) took on Italian simplicity with breadcrumbs, fresh flat leaf parsley (in lieu of basil as listed on the menu), black peppercorns, and just a hint of tomme de savoie cheese. Unfortunately, I can comment on neither their lovely wine selection or desserts, as I was trying not to overdo it that night, but at a glance, their wine selection was varied enough to keep it interesting. Judging by the full house that night and Knife and Fork’s six years in business, its daily menu iterations keep patrons coming back and gaining new customers. It’s attracted so much positive buzz, in fact, that the Southern cultural icon, Southern Living Magazine named Knife and Fork one of its Top 100 restaurants in the South. K&F shares that distinction with standouts both new and established from across the South, such as Rose’s Luxury, Fiola Mare, and Rasika (West) in Washington, DC and Crook’s Corner in Chapel Hill, North Carolina. I wish I could have made a second trip – both to Knife and Fork and its bar, Spoon, to truly appreciate their ingredient selection and creativity. Regardless, this experience reminds me that often, the most interesting food adventures are the ones closest to our own backyards. End Carrie Bradshaw-esque, cheesy reflection!